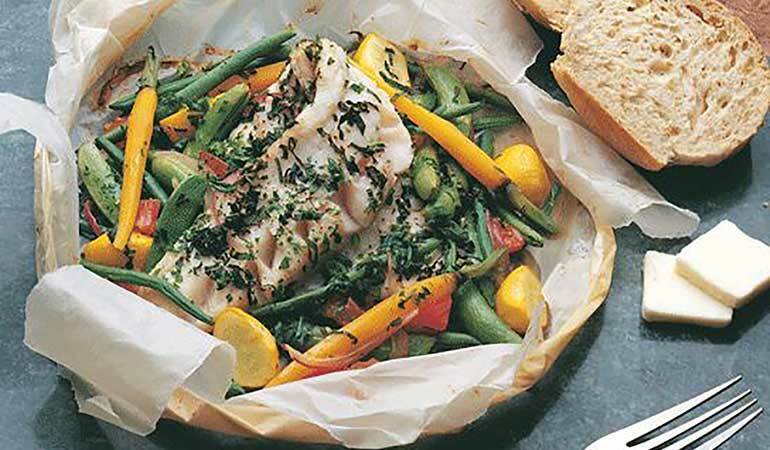 The French call this method of cooking en papillote. The food is wrapped in parchment paper or foil and baked in an oven, then opened at the table. The sudden burst of steam and aroma is wonderful. This easy and informal dinner is healthy as well. Note: You can prepare the pouches up to 6 hours in advance, as long as they are kept refrigerated. Remove pouches from refrigerator thirty minutes before you are ready to bake them. To prepare the pouches, cut one large square of parchment paper or foil into a heart shape. Spread one side thinly with butter. Place the fillet on the butter and sprinkle with salt and pepper. Place the vegetables on top and around the ­fillet. Sprinkle with the minced herbs. Fold the parchment paper or foil in half over the walleye. Overlap the edges, holding down creased edges with one index finger, using the other thumb and index finger to pinch and fold. Tuck under the excess and place on a baking sheet. Bake 6 to 8 minutes at 425 degrees. Serve immediately.